Danaë (1983) by James Turrell. Image courtesy of the Mattress Factory. Three years ago, I would drive an hour daily from Seattle into the Snoqualmie Valley in western Washington, where the cedar bark slowly rotted and gave way to nettles and fungi and ferns, to the home of my dear friends, Mark and Oda. Mark was dying, and I was his death doula. Approaching his death was much like the approach to the big blue screen of Danaë: at the threshold, it seemed impenetrable, like a wall with a light projected onto it – you know that’s the direction to go, but you see no way to go forward. As your eyes acclimate to the new surrounds, however, a depth began to emerge. When Mark was first diagnosed with ALS, his death seemed incredibly abstract. The fact that his shortness of breath and slurred speech pointed toward his approaching demise didn’t compute, and remained a flat theory about the future, albeit one that I couldn’t quite look away from. It felt like he would continue to live until one day when he would hit the wall of futurity, and that would be that; there would be nothing after. On the approach to Danaë, the blue field of light starts to change. With slow steps, I walked 10 paces forward, until I was six feet from the blue rectangle. A question pushed at my awareness: what is happening at the edges? The slightest darkening starts to form what looks like a far corner, but it’s only perceptible if you aren’t looking directly at it. Another step, and the question starts to form: is this? Another step: somewhere beyond? I spent a day inside of Danaë, watching how people interacted with the installation piece. “The corners seemed to round,” said Robert, one of 4 people I interviewed about their experience of Danaë. “And then it seemed to open up, and I did think it might keep going.” It seems both an illusion that it keeps going, and an illusion that it doesn’t, and there’s a moment where it’s almost both. 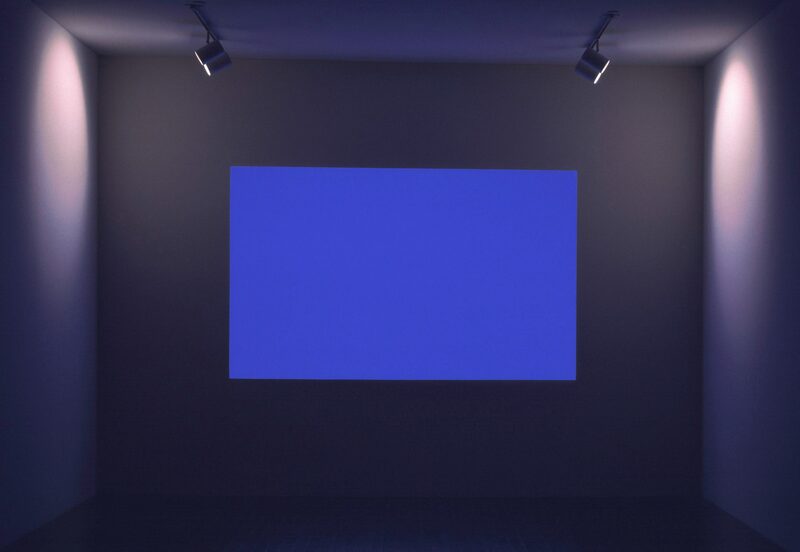 Turrell takes the viewer on a journey through the ambiguous and non-dualistic middle ground, where language doesn’t seem to hold. This is uncomfortable ground. “My work has no object, no image and no focus,” Turrell says. “With no object, no image and no focus, what are you looking at? You are looking at you looking. What is important to me is to create an experience of wordless thought” (Turrell, n.d.). Turrell designs an experience meant to both absorb us in the field of vision, and to have that field of vision reflect to us our habitual forms of perception and projection. Not only is the light projected; so too is our perception. In the dim lighting, my conceptual awareness of my body fell away while my fleshy position in the room as I walked toward the blue light became foregrounded. One of the interviewees, Gregory, described his experience of wordless thought, where rather than his verbal mind trying to figure out what was going on, his eyes began to do the thinking: “The closer I got to it, you still really couldn’t really see if it was an empty space… the depth of it, or how deep it was, so it, you know, it made your eyes think.” The verbal mind is frustrated and cast off, while the sensual mind presses to attention, trying to cut through the illusion. While caregiving for Mark, the same dynamic appeared, where two-dimensionality gave way to depth. As his disease worsened and he became progressively paralyzed, eventually using a CPAP machine to breathe and taking in nutrients through a permanent feeding tube that went directly into his stomach, the radiance of his nearing death was in the air around us. As that reality took up more of my field of vision, the division between life and death began to seem less concrete. Within a few feet of the bath of blue light emanating from Danaë, my gaze drew me forward with a question mark. It becomes almost undeniable from this distance: am I seeing beyond the wall? The answer seemed to be an indisputable yes, but as soon as yes was pulled from my eyes, my mouth made the shape of a no. Robert remarked, “I wondered if somehow it would transform if I stayed staring at it.” There was a sense of movement in the piece, a tension between the swath of the even hue and the delicate corners that were just barely darker than the rest of the field. Allison noted, “it was hard to wrap your head around the fact that it’s not 2-dimensional because you feel like it is, and you want to believe that it is, and it’s not.” There are two ways to settle the question: through faith, or through experimentation. Living in Washington State, where physician aid in dying is a legal option, Mark decided to end his life on his own terms, before losing his already tenuous ability to communicate by using one finger to type on his iPad. I arrived at his house on April 20th, 2015, knowing that was the day he would end his own life. The previous weeks he had been struggling with oxygen starvation, and needed ever more morphine and medical marijuana to keep his pain at bay and his breathing relaxed, but he didn’t like how loopy it made him feel. Oda and I sat with Mark as he self-administered a lethal dose of sleeping pills that we had dissolved in vodka so that he could inject it through his feeding tube. We held his hands and said our final goodbyes. Mark fell asleep, and after about 20 minutes we turned off his CPAP machine. He wasn’t connected to any monitors, so we couldn’t tell exactly when he died. What I thought would be so obvious to me – the moment of his death – turned out to be subtle; a spacious gradient between living and not living. The threshold of death was more permeable than I’d imagined. Turrell described of his work: “We know light like this, but we just don’t generally see it with our eyes open. However, everyone that talks about the near-death experience, or enlightenment or samatha, always does this in a vocabulary of light” (Edward, 2013). It’s the light you see inside closed eyelids. Turrell renders visible a form of revelation: light becomes material at the threshold. I realize after an hour as I finally sit against the wall near the entrance to the room that there is no bench from which to sit and contemplate Danaë. Turrell sacrificed the bench, underscoring the importance of the viewer’s body in motion. The approach to the light is what facilitates the experience of revelation. Yet this decision still allowed for many ways of engaging with the piece. The even and engulfing violet-blue light invites the projection of what is already meaningful to each person. A couple walks in not long after this, holding hands, until they turn and see me, and let go. They pause for a few seconds at the entrance of the room before they both pull out their smartphones to take photos. The woman takes a selfie posed with her back to the blue light, and I can see her tiny silhouette on the screen of her phone. Neither of them get close enough to the light to have that a-ha moment of seeing the surface give way to depth before they leave. Lifson, Edward. (September 7, 2013). James Turrell Experiments With The ‘Thingness Of Light Itself. NPR, Fine Art. Retrieved from http://www.npr.org/2013/09/07/219367766/james-turrell-experiments-with-the-thingness-of-light-itself. Turrell, James. (n.d.). Introduction. Retrieved from http://jamesturrell.com/about/introduction/.